Clinical Nephrology and Research is a multidisciplinary, open access, peer reviewed, scholarly journal that publishes original scientific manuscripts based on recent research innovations pertaining to the diagnosis and management of kidney diseases. 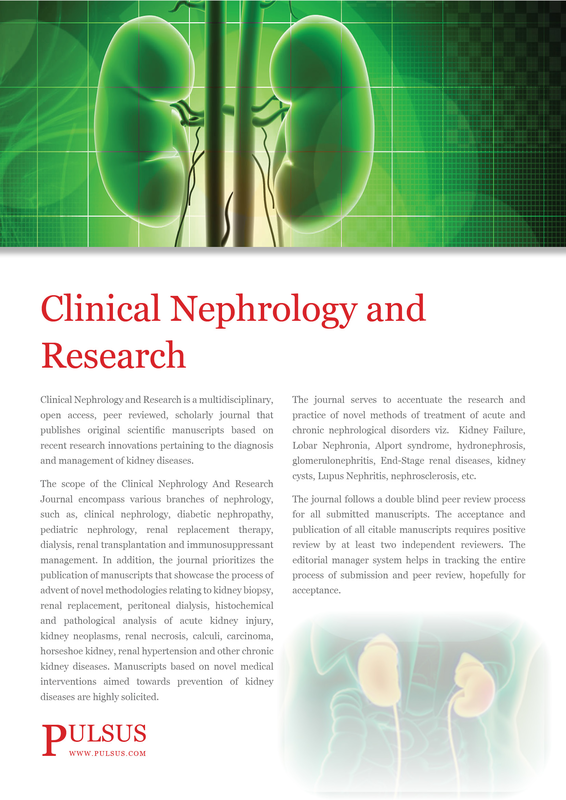 The scope of the Clinical Nephrology And Research Journal encompass various branches of nephrology, such as, clinical nephrology, diabetic nephropathy, pediatric nephrology, renal replacement therapy, dialysis, renal transplantation and immunosuppressant management. In addition, the journal prioritizes the publication of manuscripts that showcase the process of advent of novel methodologies relating to kidney biopsy, renal replacement, peritoneal dialysis, histochemical and pathological analysis of acute kidney injury, kidney neoplasms, renal necrosis, calculi, carcinoma, horseshoe kidney, renal hypertension and other chronic kidney diseases. Manuscripts based on novel medical interventions aimed towards prevention of kidney diseases are highly solicited. The journal serves to accentuate the research and practice of novel methods of treatment of acute and chronic nephrological disorders viz. Kidney Failure, Lobar Nephronia, Alport syndrome, hydronephrosis, glomerulonephritis, End-Stage renal diseases, kidney cysts, Lupus Nephritis, nephrosclerosis, etc. The journal follows a double blind peer review process for all submitted manuscripts. The acceptance and publication of all citable manuscripts requires positive review by at least two independent reviewers. The editorial manager system helps in tracking the entire process of submission and peer review, hopefully for acceptance.